Like every other fan of action movies, I went to see Indiana Jones and the Last Crusade when it came out in 1989. I enjoyed the film as an entertaining adventure, notwithstanding the silly premise and the wildly improbable plot. As the story neared its climax, our heroes arrived at the Canyon of the Crescent Moon, where, according to their research, they believed they’d find the temple in which the Holy Grail had been kept hidden all these centuries. And as they rode on horseback through a narrow gorge into this supposedly secret site and the canyon walls opened to reveal the reddish facade of a huge temple carved into a cliff face, my reaction was a bit different from that of most of the other theatergoers. I was thinking: “Hey, my grandparents visited there! I remember seeing the slides when I was a kid.” And I was right: that scene had been shot on location in Petra, Jordan—one of many famous sites my grandparents had visited and photographed on their travels in the Middle East. The name Petra, from the Greek word for “rock,” aptly describes this long-deserted city that is best known for its numerous buildings and tombs carved directly into sandstone cliffs—many with elaborate facades that would have been challenging to create even for free-standing structures. Everything about Petra seems improbable, from its location to its architecture to the fact that it was mostly forgotten for hundreds of years. Nothing but the outside of that one building is really the way the movie depicts it, but Petra contains enough mysteries and surprises that you could almost believe any fanciful tale about the city. The desert canyon now known as Petra was first settled in roughly the sixth century BCE by a formerly nomadic group of Arabian people called the Nabataeans. The Nabataeans had begun carving buildings and tombs into the stone by at least the third century BCE; they also developed a sophisticated aqueduct system to supply plentiful fresh water to the city from springs several miles away. Because of the city’s strategic location at the intersection of two major international trade routes, it soon became a center of commerce. Trade in spices, incense, perfumes, textiles, and other products made Petra a large and wealthy community; residents numbered an estimated 20,000 around the beginning of the first millennium CE. The city was annexed by Rome in 106 CE. The Romans maintained the city as a commercial center for more than two centuries; they also exerted a great deal of influence on its culture and, of course, its architecture. Some of the most impressive ruins visible today are from the Roman era, including an amphitheater. A tremendous earthquake rocked the area in 363 CE, destroying about half the city. By that time, Constantinople had become the new Roman capital. Because of Petra’s decreasing importance as a trade center, the city had neither the impetus nor the resources to rebuild, and soon lost most of its population. Little is known about what went on in Petra from around the early seventh century CE until the 19th century; it appears to have been inhabited—at least sporadically—but clearly not a town of any interest beyond its immediate environs. In 1812, a Swiss explorer named Johann Ludwig Burckhardt “rediscovered” Petra—which is to say, he was the first European to come upon the site, and was therefore largely responsible for getting it on maps made by western cartographers. 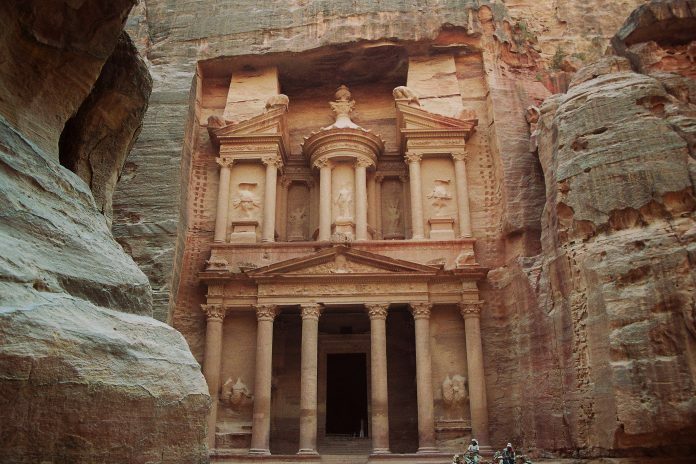 Today, Petra (a UNESCO World Heritage site) is a hot spot for archeologists—if Indiana Jones were a real person, he’d probably be digging there. Only about 15% of the city has been excavated so far, but fascinating new discoveries are being unearthed on an almost daily basis. The Jordanian government, meanwhile, is simultaneously eager to promote tourism and anxious about the wear it inevitably causes to the ancient structures. Discovering Petra’s remaining secrets without destroying it is the researchers’ holy grail. Note: This is an updated version of an article that originally appeared on Interesting Thing of the Day on March 10, 2005.